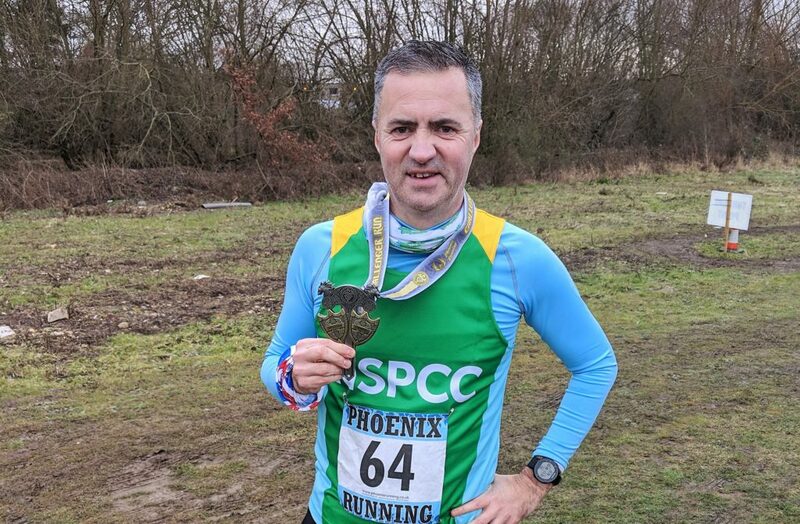 The ‘Friendly Frolic’ was a charity fun run, that took place on 10th March 2019, as a fundraiser for the NSPCC. This made up part of my fundraising for the year, as I build up to running the London marathon for the charity in April. The plan was to create a run that was fun (of course), did not put runners under pressure, created a friendly sociable atmosphere and appealed to the widest possible audience. I like to think we ticked all of those boxes. The day brought with it a real mixed bag of weather. 50 mph winds, some rain, some hail, but of course some glorious sunshine. The run was organised as a ‘Frolic’. Running as many or as few laps as runners wanted to, over a given period of time, in this case 5 hours. The twist on the normal format, was that instead of one course, we had 5 loops to choose from, all of which started and ended at the Bargeman Rest in Newport, who acted as our wonderful hosts for the day. It wasn’t marshalled, it wasn’t timed, there were no prizes. Just lot’s of runners getting out, having fun, and donating money to a great cause. The loops provided some variety. Flat ones, hilly ones, cycle paths, main roads, tarmac and footpaths. They also provided much debate amongst the runners. Should I get the long loop (11 miles) out the way first? Shall I run a mixture of loops of repeat the same one? As it happened, there really was a mixture. Many ran one loop, some collected a range of different loops, some ran the same loop 4 times! Some ran 4 miles, some ran with their children, some ran solo with their headphones in, some ran en masse with their mates, some ran a marathon! Another important aspect, was that it was an ideal framework for people to get in a long marathon training run. It gave people the support of a drink station and some much needed snacks, whilst they took on a long training run. 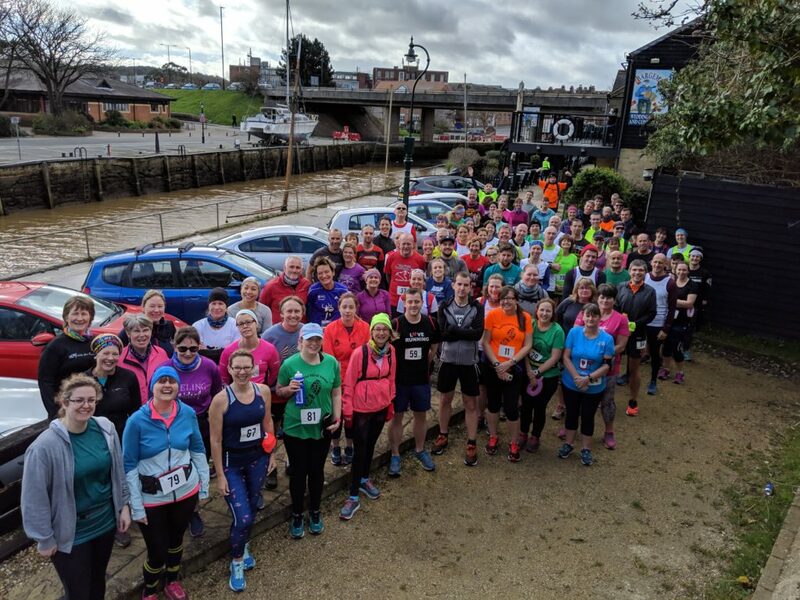 We had 25 runners who ran over 15 miles, a run which I’m sure will stand them in good stead for the upcoming Spring marathons, as they go off to tackle the likes of the London, Brighton, Manchester and Southampton courses. A special well done to the young man that was just 8 years old, that went out on a 3 mile run with his Mum. Another big congrats to Kelly Forster and her son Louis. I’m not sure who dragged who round, but young Louis complete half marathon distance for the first time. It wasn’t a competition, but I do need to say well done to the 3 runners that completed approximately marathon mileage. They were Sarah Holmes who ran the furthest by running the same out and back loop 4 times! Phil Mannall who clocked up a marathon if we include his run from home to the start, and Matt Fletcher who ran approx 25 miles as he gets ready for the London Marathon. Well done to everybody that took part, you were all winners, and thank you to our hosts The Bargemans Rest and to our team of helpers, Ruth, Claire, Giorgio and Luke. This marathon was one of the ones I picked as it would be a bit ‘different’. This was a track marathon, yes, a marathon, round a track. 400 meters, over and over, 106 times! I was kind of looking forward to it. Having done better than expected in marathon number 2, 2 weeks ago, and having had some good workouts since then, I was feeling confident. I had done a 30 lap test run at my local track, so felt all would be good. So, first the good news…. I finished it in 3:56:07. That’s a PB by 1:38 🙂 Really pleased with that of course. Another plus is that the running surface is perfect, a nice flat bouncy track. And another, drinks are easy! A well stocked drink / food station on the straight, you can leave you own drinks, pick up a drink and put it down by the track ready to pick up later, I even had time to pop to my bag next to lane 8 and grab my headphones when the going got tough. Well, as various people had warned me, running round a track 106 times will drive you nuts…. and yes to some extent it did. Not because it’s so boring, or made me dizzy, or made me lean to one side! No, with the track running it was just the number of laps that got to me. When you reach about 21 miles in a marathon, it tends to be around crisis point in one way or another, you are tired and vulnerable. Normally, the strong part of your mind will step in – “It’s just 5 miles, just get this next mile done, you got this!”. However, on the track, the screen was telling me I’d run a whopping 84 laps, and this time a not so strong mind delivered the realisation that “OMG you still have 22 laps to do, are you kidding me?!”. In a road marathon, usually everyone is running 26.2 miles. If someone is running near you, that must be running a similar pace to you, they probably have similar goals. Not the case on the track. You regularly see the whole field, people running a 10k, people run / walking an ultra, people dressed as up. I found that quite a distraction. Never been good at running past people walking. Another issue was the whole lane etiquette thing. So obviously everyone wants to run on the inside of lane 1, otherwise you are running a lot further than you need to. But with runners going at such different paces, and some with headphones in, that gets tricky. And it’s not just about who is in front of you, will you undertake, will they leave enough room, have they heard you…. there is always the constant issue of knowing who is behind you about to run past, as you really don’t want to be that person slowing them down. So I set out running at an ambitious pace of around 8:20 mins per mile. I knew there would be a controlled degradation of that pace, but didn’t expect the second half to feel so difficult. Why did it feel so hard? The mental aspects of so many laps was definitely a factor. The pace I started at also was a factor. I also feel that the track is an issue. Yes it is springy and responsive, which makes it possible to run a bit faster, but my theory is that this takes it’s toll on the body. I was wearing compression sleeves on my calves, but my thighs and hips really did feel it for the second half. Anyway, job done, 3 down, 9 to go. Really pleased to get a PB in the bag on this challenge. Next it’s off to London at the end of April to run the greatest marathon in the world! Marathon #2, 3 weeks after #1, and a welcome return to running on tarmac after the mud of Essex in January. Another welcome change was being joined on this trip by some club mates, Steve, Mick and Sarah. Two joined me for the trip down, and one lives locally. That makes it much easier and more fun. The Martello Marathon is named after the Martello towers that decorate the Kent coast, and a couple of them are usually in view on this run. The run all takes place on the seafront, between Folkestone and Hythe. 3 out and back laps, of 8.74 miles each. Dead flat, and the only obstacles are local dog walkers, out enjoying the weather. It was a beautiful day, a little bit warm for February, up to 15 degrees I think, and not a cloud in the sky. My plan for the run, was to run the first 2 laps at a decent pace, and give myself a shot at running a 4 hour time, something I’ve only done once before. 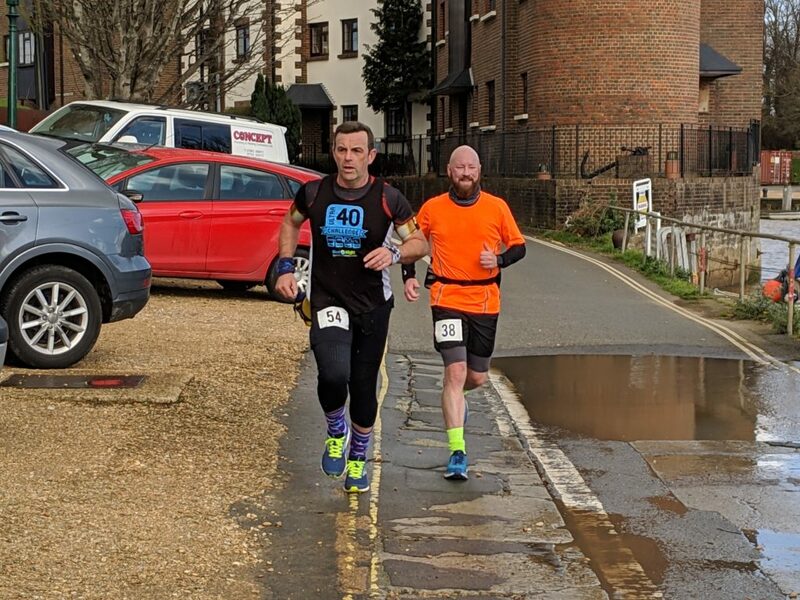 As happened in marathon #1, I was lucky enough again to get chatting with someone who turned out to be a very useful running partner, thank you Paul! We got chatting after about a mile, and ended up finishing the marathon together. He was an experienced campaigner with over 200 marathons under his belt, and we took turns dragging each other along as the miles ticked by. After 2 laps, that was 17.5 miles in, I was behind the pace I’d hoped to set, but found that I was still feeling OK, and was still managing to put in 9 minute miles. They became 9:15s, 9:30s, and then the last 2 or 3 miles really did get quite tough. Eventually the finish line came into sight, and crossed it to clock a time of 3:58:56. Delighted to get under 4 hours again. Job done for February. 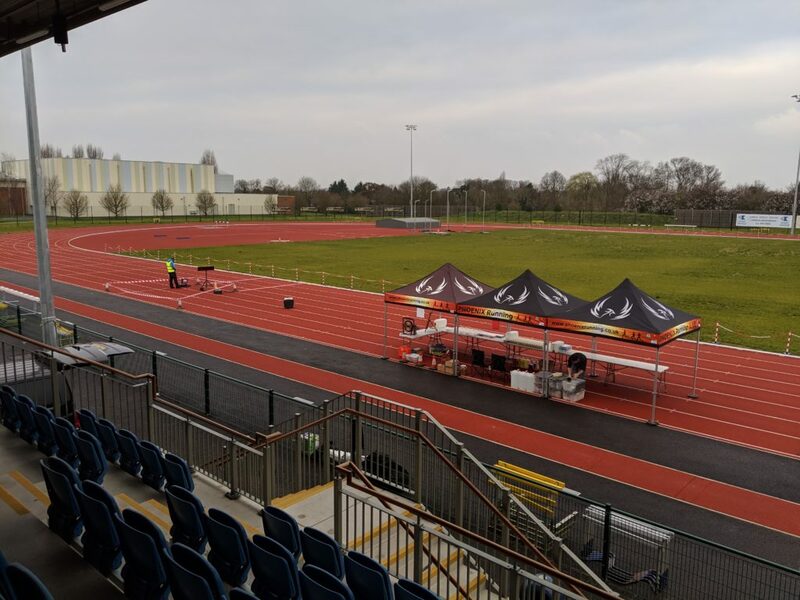 Next up a track marathon on 1st March, that will be an experience! So how do you train in between marathons? Well… when I figure it out I’ll let you know! This has been a question mark for me coming into this year. The answer for me is going to be trial and error. Marathon #1 and #2 are 3 weeks apart, well, just under 3 weeks. Found the Excalibur One marathon quite tough, as it was pretty muddy and I’ve only run marathons previously on tarmac. So, was resting up afterwards, and once I’d missed some runs due to snow etc, before I knew it I’d had 8 days off! So this week I’ve run 12 miles, and a couple of 7 mile runs, with a half marathon to come, so that will end up close to 40 miles, a big week for me. Marathon #2 is next Friday, so a couple of short, quicker runs next week to keep the legs moving and that will be it. Will that be a good approach? We will find out on 15th February in Folkestone! After that it is just over 2 weeks until an early March marathon, so if I got it wrong we can try something different. And they’re off! Marathon one is in the books, and we are injury free and looking forward to the February episode. This was a 3.3 mile loop (8 of! ), from a centrally located Race HQ, along the towpath by the Rover Stort, back along the other side of the river which was more of a trail, cross a footbridge back onto the towpath, back to HQ. Race HQ consisted gazebos housing some friendly helpers, a wide array of sweets and snacks, and a clever drinks system allowing you to order water and different flavours of squash ready for your next visit. In theory, I thought this looked like a potentially quick marathon. However, in practise it certainly was not. 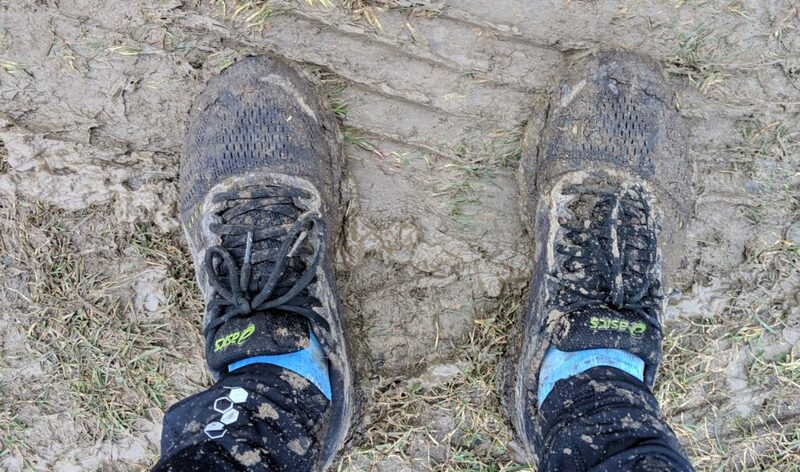 The course was used for a similar event the day before, so the trial side of the course was muddy. Then it rained all night, do the course suffered further. The HQ area was also getting pretty brown. I really had not worn the right shoes, so it became a bit of a challenge just to stay upright. I think as an event, this was a good one, and I’d love to have run it in better conditions, but hey, it is January. What made this one for me, was the company. There was a good friendly collection of about 100 runners out on the course, doing a range of distances. I got chatting to a very friendly chap within the first half a mile, and we ended up running with each other pretty much all day and rang the finishing bell together. Thank you Phoenix Running for a good start to the year! Am finding this quite a tricky pastime! Especially along with the logistics involved with selecting and entering 12 marathons. Then there is the travel, especially when you live on an Island, where to stay. Oh, and I guess it would be good to fit some training in as well! I found pre-Christmas, when I took on the challenge a bit of a write off. Most people are focused on Christmas, and then of course comes the long slog through January without any wages. I have spent that time focusing on some fundraising events which I hope will get me a long way towards the target. A couple of parties. I put on some food / cocktails and entertainment, my guests make a donation. Everyone is a winner hopefully, I raise some money, we all have a good time! A Race Night. This is aimed at a different group of friends. At a pub, again hopefully we raise a few pounds whilst having a good time. I’m awaiting confirmation on a treadmill run at a local supermarket. I will run something like a marathon distance on the treadmill, hopefully with my kids doing some bucket shaking. Probably the biggest event, is a Frolic run that I have organised. This is a fun run, staged over 5 hours, with a choice of laps to choose from. People choose which laps, so it is completely flexible. Some people might come and run 4 or 5 miles, some might run a marathon. I am expecting a few people to use it as a marathon prep run. I was a bit shocked by this event, as I did the groundwork, launched it as an event on Facebook, and within a day or 2 it had 250 people interested! Throughout all these events, I will sell tickets to my prize draw. I’ve been very lucky in that businesses I’m friendly with have agreed to put up some brilliant prizes. We have Festival Tickets, Shop Vouchers, Beauty Vouchers, Tickets to the Racing and lots more. Hopefully with all these things put together, we might be getting close! So the training ‘plan’ changed a lot in the run up to marathon #1. I originally had quite an intense plan, that involved losing quite a bit of weight, and completing 3 x 20 mile training runs before tackling the Phoenix Excalibur One marathon on 27th Jan. So that would pretty much match what I had done before when I trained hard for London last year. In the end I thought better of it, and decided that doing that level of training for marathon #1, was going to be too much, too soon. When I did that at the start of 2018, I had the luxury of taking a break after I had run the marathon (well after the second marathon). This time I won’t be doing that, there is a long year of marathons to conquer. So the new thinking is that marathon #1 really is considered part of the training for other marathons to come this year, hopefully some of which can get back down around the 4 hour mark that I managed last year. So on the run up for marathon #1, I did manage to get my mileage back to something sensible, putting in 80 miles for November, 90 for December. January should be back over the 100 mark again, which is where it needs to be. I’ve manage to shake off half a stone of where I’d got to after spending last June and July eating, drinking and not running much. I did manage 1 x 20 miler, around new year. My last significant training run was this week, 6 days before marathon #1. That was 11.6 miles at around the same pace that I did the first half of my sub 4 marathon in, really as a bit of a test to see where my heart rate would be at and how I would feel. So Sunday will be a bit of an unknown quantity. I need to start out slower than the test run, but how it is going to feel after 20 miles, who knows. I’ll find out at about lunchtime on Sunday! So the idea for this challenge came about a few months ago, but here we are…. it is now 2019, and we are about to kick off. It has been a quiet start. 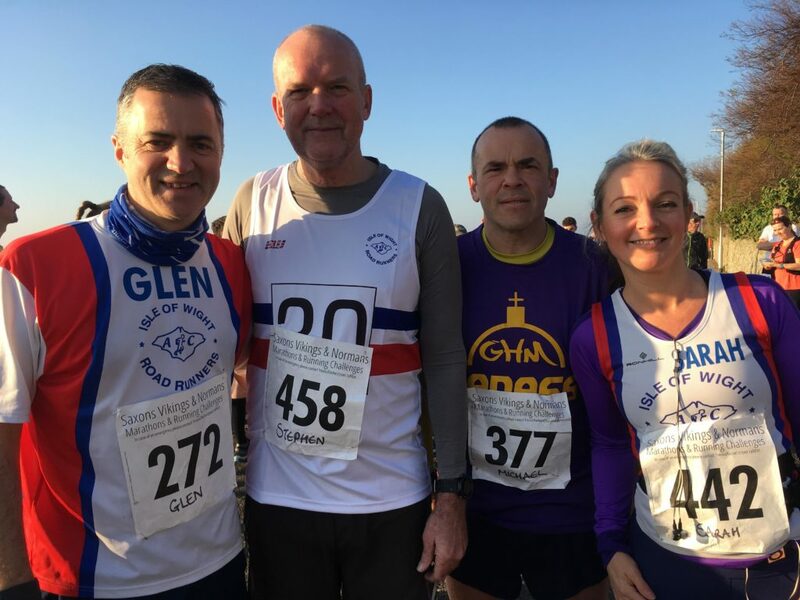 Over the Christmas period it isn’t really a good time to fundraise, so it has been a case of head down, get ready for the first marathon of the year. Alongside this, there has been a whole host of charity fundraising events to start organising. Looks like the next few month will be very busy, and the diary as been filling up. 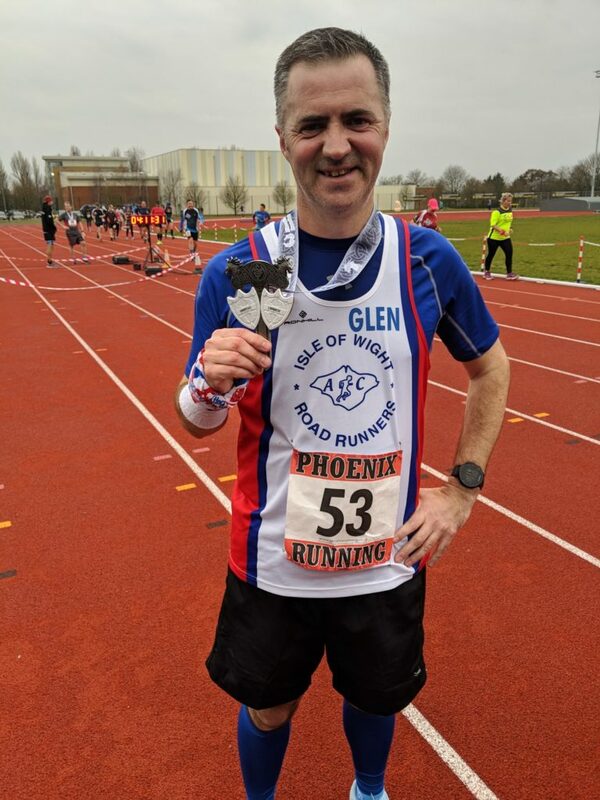 The first marathon is the Phoenix Excalibur One Marathon in Essex. Looks like quite a pleasant and flat route, only issue I can see is that it’s an 8 lap course. Already checked, headphones will be OK and may well be needed! Did have one little blip in my preparations. I forgot that before I bit the bullet and took on this challenge, I had entered the Stubbington 10K race. Was a bit of a shock when I got the email from the organisers checking I was all ready! !